All of you who are looking for superior quality Metal Flanges can turn to us! 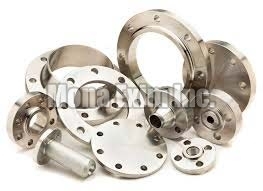 We are a top-notch Manufacturer, Exporter and Supplier of Metal Flanges from Maharashtra, India. The Metal Flanges that we bring to you are offered by us in different specifications and are resistant to corrosion. Feel free to place small as well as bulk orders of Metal Flanges with us and we will deliver the same within the promised span of time.